In just under a week, we expect the 2017 results from the National Assessment of Educational Progress (NAEP)–commonly referred to as “The Nation’s Report Card.” Scores on the exam provide critical data on academic performance, and college and career readiness among our students. They also show us whether we’re narrowing the many persistent opportunity gaps that exist between public school students–nationally, and here in Connecticut–based on race, socioeconomic status and status as English Language Learners (ELL). We examined the last set of NAEP results two years ago. Let’s recap those numbers as we prepare for 2017 outcomes: what they meant for our state and our students, and how they’ll frame our view of next week’s release. In 2015, ConnCAN focused our analysis on the performance of fourth- and eighth-grade students in the subjects of math and reading. We also broke down our analysis by race, socioeconomic status and ELL status. 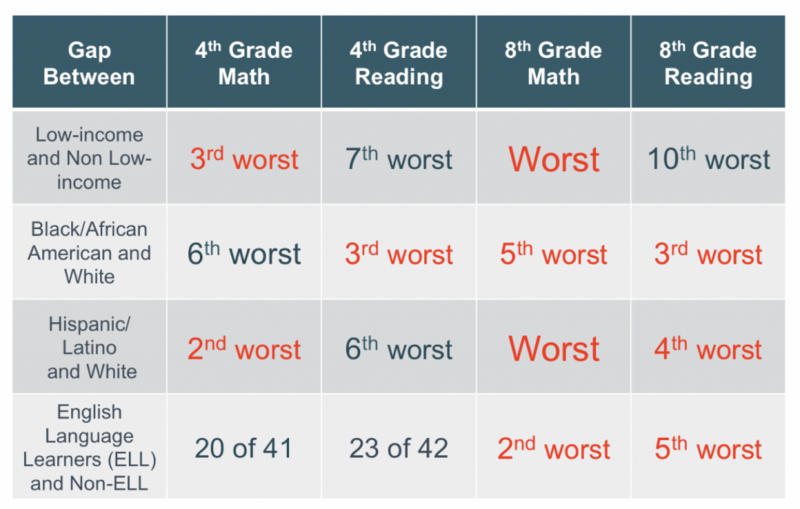 The good news: Based on the overall 2015 NAEP results for Connecticut, our fourth- and eighth-grade students outperformed the national average in both math and reading. Still, less than half of Connecticut students demonstrated proficiency in either subject–and Connecticut’s fourth-grade math results decreased by 3 percentage points between 2015 and 2013. Overall, fourth- and eighth-grade students in Connecticut performed above the national average–but these results were not distributed equally among the kids in our state. The further we dig into the data, the more alarming the picture becomes for. diverse students. For every student subgroup–including those based on race, socioeconomic status and ELL status– scores fell between two-to-six grade levels behind their peers. This is an especially urgent issue because nearly one-third of Connecticut’s working-age population by 2020 will be comprised of people of color. Most notably, Connecticut still has some of the worst achievement gaps in the nation, including major gaps in eighth-grade math education between low-income and non-low-income students, and Hispanic students and their non-Hispanic peers. The good news: Results from the 2015 NAEP showed signs of a shrinking achievement gap between Hispanic students and their non-Hispanic peers, closing by 12 percentage points since 1998. 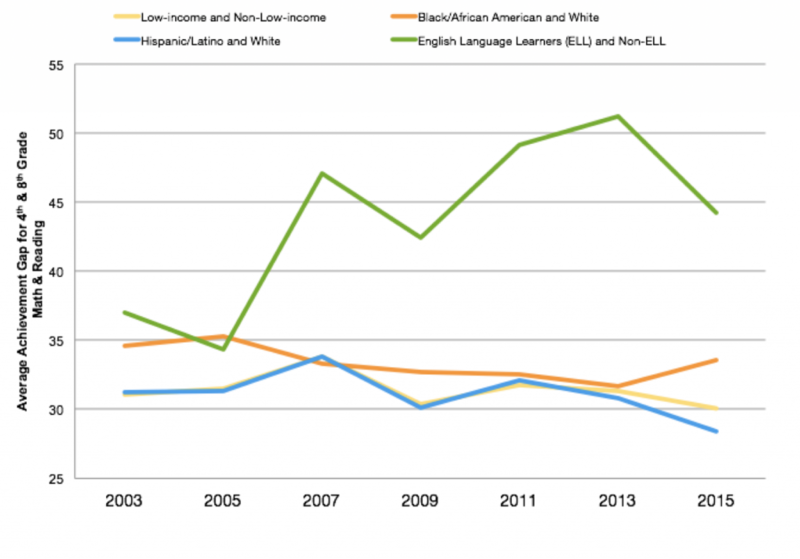 Connecticut also saw dramatic improvements in the gap between ELL and non-ELL achievement. But we haven’t made these gains for every student. The graph below shows the achievement gaps that have separated student groups from 2003 to 2015. Not only has the gap persisted on the whole, but for some kids, the gap is actually widening over time. For example, while the national reading gap narrowed for black students in fourth grade reading narrowed, it grew larger in Connecticut. While immediate efforts to address these alarming gaps are needed throughout the state, these improvements show that progress is being made and can be made for all children in Connecticut. Is our state improving over time? By 2020, more than 70 percent of jobs in Connecticut will require some education beyond high school. Are we seeing the improvements necessary to get a higher percentage of our students ready for college and career? Are our efforts to increase performance in the state paying off? Have we been successful in closing our state’s achievement gaps? What are the trends in our states most persistent achievement gaps and are statewide efforts to close achievement gaps having immediate impact for students? Are our students ready for the 21st-century economy? Eight in 10 of Connecticut’s fastest growing careers that require a bachelor’s degree also require deep knowledge of STEM, but fewer than half of our students are meeting or exceeding expectations in math and science. Are our students keeping pace with subjects that will lead to successful careers in the 21st century economy? Is Connecticut setting itself up to attract top jobs and opportunities nationwide, and among our neighboring states? We’ll see you back here on April 10 to explore the latest results together. Jennifer Ellis is ConnCAN’s director of Research & Policy. More about NAEP: NAEP is the largest nationally-representative student assessment. 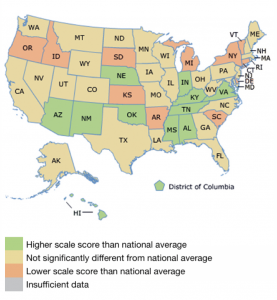 The results provide a common measure of achievement that allows us to compare national, state, and district results and to track changes in achievement for fourth, eighth, and twelfth-graders in math, reading, writing, science, and other subjects. Results are also based on representative samples of students that reflect geographic, racial, ethnic and socioeconomic diversity.